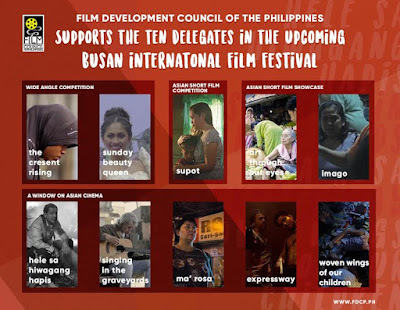 Accompanying the ten (10) Filipino films representing the best of our local culture at the 21st Busan International Film Festival (BIFF) this October 2016 is the Film Development Council of the Philippines (FDCP), taking the trip to South Korea in an extension of support and celebration for the filmmakers in their display of fantastic works to the international audience, many of the films premiering for the first time at the festival. Ready to make waves at BIFF’s section dedicated to Asian filmmakers, A Window on Asian Cinema, are Berlin International Film Festival Silver Bear Alfred Bauer Prize-winning Hele sa Hiwagang Hapis by Lav Diaz, Cannes Best Actress-awarded Ma’ Rosa by Brillante Mendoza, and Venice International Film Festival-exhibited film, Singing in Graveyards by Bradley Liew. The three films are joined by Expressway by Ato Bautista, which makes its international premiere at the BIFF, and Woven Wings of Our Children by Anton Juan, debuting to the world also at the festival. Included in the Wide Angle Documentary Showcase are Baby Ruth Villarama’s Sunday Beauty Queen about OFWs in a beauty contest and Sheron Dayoc’s Crescent Rising about the conflict in Mindanao—both films vying against numerous other documentaries for the BIFF Mecenat Award and Busan Cinephile Award. Competing in the Wide Angle Asian Short Film Competition is Phil Giordano’s Supot, and exhibiting in the Short Film Showcase is Raymund Gutierrez’s Imago, which also competed in the recent Cannes Film Festival, and Brillante Mendoza’s Amorsolo’s Dream, part of the omnibus short film Art Through Our Eyes made with four other excellent Southeast Asian directors and the National Gallery Singapore. The filmmakers of these brilliant works were the first recipients of the FDCP’s travel assistance program to help filmmakers in their attendance of international film festivals abroad. And on October 10th, the FDCP, lead by Chair Liza Diño, will be hosting a Philippine night at the BIFF to celebrate the triumphs of Philippine cinema at the festival together with the Filipino filmmakers as well as the Embassy of the Philippines in South Korea, with H.E. Ambassador Raul S. Hernandez. Festival directors and international distributors will also be invited to the event, to be introduced in the “Shoot in the Philippines” campaign with the FDCP’s Philippine Film Export Service Office (PFESO) program, an effort to bring international filmmakers to the country for their production and promote our local talent and tourism. The FDCP will also be engaging in the BIFF’s Asian Film Market, “a total film market covering all stages of film industry from pre-production to film sales with industry experts.” There vibrant works of contemporary Philippine cinema will be offered for distribution via the film catalog, which compiled numerous films sent in from the FDCP’s open call for filmmakers. The Philippines’s local delegates at the BIFF will also be promoted there as well, with materials created solely for the Filipino films showing in Busan. With the Film Development Council of the Philippines’s participation in the Busan International Film Festival, it hopes to set its template for supporting Filipino films in upcoming international festivals and aims to help continue a stellar year for Philippine cinema.